The Third Silk Road (Dunhuang) International Cultural Expo will be held in Dunhuang City, Gansu province, September 27-28, according to a news briefing held in Beijing on Thursday. 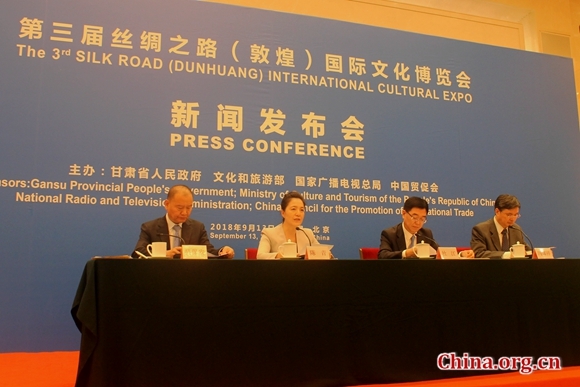 With the theme of "Showcasing the glamor of the Silk Road, promoting people-to-people exchanges and making the world more harmonious and beautiful," the expo will present various activities, including a summit conference, forums, art performances and cultural exhibitions, according to Chen Qing, director of the Publicity Department of the CPC Gansu Provincial Committee. The expo will enhance technological applications and realize digital management of information and services, Chen said. Various new media platforms will be used to disseminate information on the progress of the event, she added. To promote Dunhuang culture to a greater extent, a total of 245 ancient string, percussion and wind instruments that appeared on the famous Dunhuang grotto frescos have been recreated and restored, and will be exhibited and played, Chen said. Master artists from the Repin Academy of Fine Arts in Russia were invited to create oil paintings on the Dunhuang cultural theme, and the works will be showcased during the expo, she added. Some 1,000 guests from over 100 countries and regions are expected to attend the expo, with Ukraine being the special "guest country." Jointly sponsored by the Gansu Provincial People's Government, the Ministry of Culture and Tourism, the National Radio and Television Administration and the China Council for the Promotion of International Trade, the previous two sessions of the event took place in Dunhuang in 2016 and 2017. The Third Silk Road (Dunhuang) International Cultural Expo will be held in Dunhuang City, Gansu province, Sept. 27-28.